A spectacularly located and comfortable holiday home with 12m solar heated and sliding covered swimming pool in extensive grounds with fabulous views. House is tastefully and comfortably furnished. Outdoor hot tub, gym, sauna, wireless Internet, and log fires. A particular feature of the property is that it is for two to six people yet is not part of a complex. there is a high degree of privacy. We have had hundreds of satisfied guests from all over the world and we have a house book full of appreciative comments. DeiMori La Massa proves very popular and we recommend early reservation. This property usually 'sells out' - we have guests who regularly return. The Guest Accommodation is situated in a wing of the large house and has a private entrance and furnished sun terraces. The whole has been completely refurbished, decorated and furnished to a high standard. The living area is comfortable with sofas and individual armchairs, a hardwood dining table and chairs and occasional furniture. The kitchen area is finished and equipped to a high standard by an exclusive Italian designer and manufacturer. There is a wood-burning stove for the cooler evenings and the whole suite is centrally heated for winter use. The bathrooms(s) feature large high quality shower cubicles with ‘power shower heads’, wash hand basins and WCs with bidet showers. The bedroom(s) have new beds, quality linen and plenty of storage space. We have a 12 metre ‘L’ shaped and landscaped solar heated pool which has a good length for lap swimmers. A great new feature for the pool is the retractable cover which can be pulled back in fine weather and closed over during less good conditions. This allows guests to swim almost in conservatory condition and be sheltered. We have an outdoor spa pool with wonderful views. We have a very well equipped gym and sauna (small extra charge for sauna). Daniele is a native Tuscan and has run DeiMori La Massa since 2003 and DeiMori Bed and Breakfast in Florence since 1996. During this time he has met thousands of satisfied guests. His aim is to advise and support in a helpful yet unobtrusive way in the hope that travelers can gain the most from this most beautiful and fascinating of regions. He has spent time gaining information and he presents some of this for you in the hope that it will aid your planning and will enhance your stay in his part of the world. His mother tongue is Italian, but he speaks almost fluent English, some French and elementary Spanish. He takes great delight in meeting and helping his guests to have a wonderful time. Everybody loves our bathrooms with their walls surfaced in crushed marble. Each bathroom features a large shower cubicle, wash hand basin, WC and shower bidet. Hairdriers are provided in each. We have a small fitness area which guests are welcome to use. The usual selection of channels are available We do have a SKY receiver so yo might bring your "sky card/contract" if you have one. A quality BOSE docking station is provided - soon to be bluetooth connected. Asmall fiction library and books detailing the local area. Very large terraces with outstanding views. We have an indoor sauna - supposed to be for three people - but probably more comfortable with two. Our villa has a private pool and this is solar heated plus protect by a sliding cover for comfortable swimming with bad weather or off-season. Fabulous views can be enjoyed from the sun terrace. What a wonderful exerience ! I finally got known on how a lady last year could leave a nasty review o my place even without having confirmed no booking. Here it comes that an inquiry of mine just to find out about HomeAway prices and procedures, inquiry that of course I have never confirmed ends up asking e how was my stay with myself in my own property : there is something wrong here people of HomeAway. Do please check upon your procedures and controls. Do please delete also that nasty revenging review of a guest that until 4 months after her stay which she judged "great", suddenly while I've realised that she had not paid and asked her the payment it became a nightmare . At that time I've asked your assistance but you went on her side causing me big losses . This is our third visit to Vertelli, La Massa. This time we brought three of our children and another totaling six altogether. The accommodation worked just as well with six as with the two of us. The accommodation consisted of three rooms each with perfect en-suites and open doors enabling easy access outside.There is also access to the living areas which are all well stocked and the rooms were tastefully decorated. We had many a meal sat outside eating local produce, drinking wine and limoncello whilst watching the stars. Danny is constantly and tastefully improving the house whilst ensuring the house is environmentally friendly and sitting comfortably amongst the stunning scenery which he grew up in and still cherishes. It is an honour to be able to share such a beautiful area of Tuscany undisturbed by mass tourism and be welcomed as a friend. The house is clean and the rooms are kept cool and comfortable at night to ensure a peaceful nights sleep. Danny has all the local information at his fingertips on visits, travel, and places to buy local produce. He is there when needed but never intrusive. This time we visited a Chianti vineyard where we tasted and sampled their local wine, learned about the production, toured the fields of vines before being entertained with a brilliant lunch in the main hall of the Castello. An excellent day. We also visited Florence where the temperature reached 39 degrees C. A very lovely city full of amazing art work but we were pleased to return to the peace of Vertelli and the welcoming dip in the pool. Other visits included Poppi and local town visits as well as several good meals in local restaurants which Danny recommended.Watch out for Danny's amazing simple and easy to follow recipes which come tried and tested and make for a memorable meal on the terraces. Thank you for another relaxing and peaceful stay and we shall be thinking of planning our next visit to the valley and La Massa. This is a very isolated location and the nearest shops are a good 20 minutes drive away. The scenery and property are very nice but it is not at all private, the owners are constantly creeping up on you, ostensibly to see if there is anything you need, and when the owners have guests they take over the pool and make it feel awkward to sit on the terrace. More like a B&B where you are expected to leave during the day than somewhere to relax in private. Great house and the best host! We absolutely loved our stay at LaMassa. The property is situated in a rustic setting with spectacular views of the surrounding mountains. It is wonderfully landscaped to provide a thousand beautiful spaces that highlight the gorgeous plantings and natural plants. There are a number of areas to relax and enjoy. The pool is amazing, offering a covered warm environment when needed on chilly days, but can be open on warmer days. We loved to sit outside and hear only the rushing of the nearby stream, and at night see only the few dim lights of mountain cottages in the distance. The house is well furnished, perfectly laid out to accommodate a few or many. The bedrooms were lovely, comfortable beds and we appreciated the en-suite bathrooms. The beautiful kitchen is well designed and equipped. Danny is a gracious and accommodating host. The fantastic welcome basket of local products was greatly appreciated. Danny was very welcoming and attentive in orienting us to the property, the local attractions, and provided us with a lot of vital information that helped us during our stay. While there, we took many day trips to the well known, popular Tuscan sites (Florence, Siena, Assisi, SanG, Montepulciano, etc); our favorite days were those that we spent more locally, spending more time at the house and visiting great local sites (such as Poppi Castle) that have very few other tourists. I know this is something that no trainer would teach a owner to write as a response of a review, I know that would make someone laugh but .... you made me moved, you made my day. It was a lovely time to spend together and you made me so happy every day, being so appreciative of LaMassa and Tuscany and Italy and life . Thank you for your lovely feedback - priceless. It will be great to meet each other somewhere in the planet. Dei Mori La Massa is the perfect relaxing getaway in a beautiful, remote corner of Tuscany. 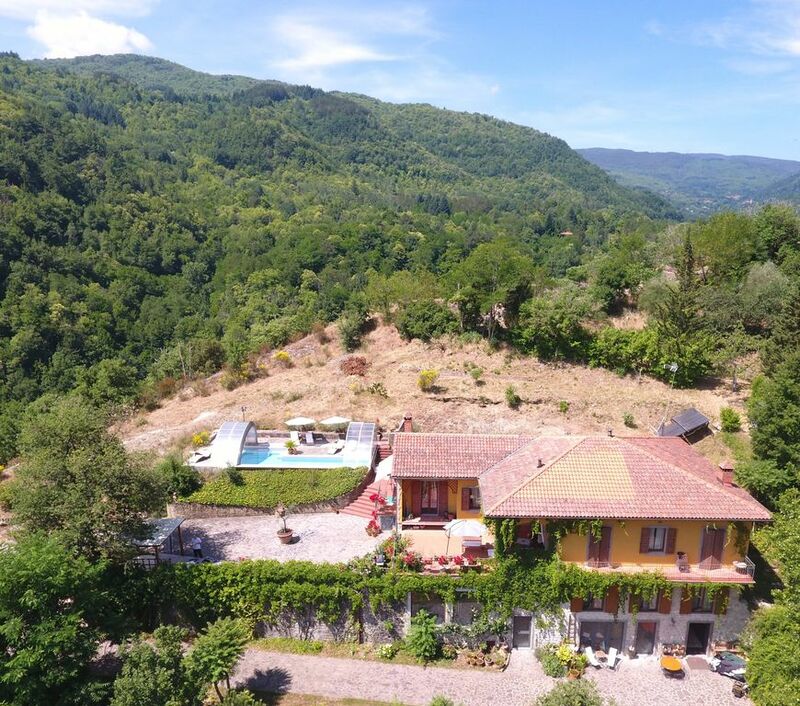 The Casentino is ideal for those who are looking for amazing scenery, hiking, hearty classic Tuscan cuisine and exploring small, friendly towns and villages. La Massa is secluded and private and has everything needed for a comfortable stay. The newly redecorated bedrooms are lovely. Danny has an artist's eye and his creative touches give each of the beautiful rooms a unique identity. The open plan kitchen is perfect. We loved cooking dinner with music playing and all the doors open to the beautiful hills of Vertelli. Sitting on the open terrace in the morning watching the sunrise is a magical experience. Danny is the perfect host and an endless source of valuable information about the area and its towns, restaurants and food. This was our third stay at La Massa and it will not be our last! Apart from a shaky start to our holiday of not being able to locate Villa La Massa (we are not the best navigators), our stay in Vertelli was very pleasant. Daniele, the gracious owner of the villa came to our rescue in a nearby town and accompanied us to his home where we were amazed to find a welcome basket full of goodies (a rarity indeed). There were sufficent supplies to concoct a meal which was a godsend as we had arrived so late in the day. The villa was charming as described however it was Daniele's accomodating and helpful nature that made our stay so relaxing. He is very knowledgeable and gave us much advice on what to do and see. Our trip to Florence was wonderful as was the visit to Poppi castle however other nearby towns were a little dissappointing in our opinion. Overall a most enjoyable holiday with a charming host in the shape of Daniele !! Thank you so much for your appreciative words and consideration, if I would have known how I could have achieved the 5th star I would have done my best to get that far. It has been nice to meet you and your family. Have a great Summer back to the UK. There are many activities available in the immediate area and these include the following: Hill walking and rambling. Horse riding. Cycling along the peaceful roads and tracks. Bird Watching. Golf at a local course with daily membership available at reasonable rates. Guests report that the course is excellent and that the views are magnificent. Clubs are available for hire and there is also a golf driving range. The local Tuscan Hill Towns and Villages – one of the most beautiful being Poppi about 10 Minutes drive away. Arezzo, the provincial capital with its elegant squares, winding streets and wide range of shops. Siena can be reached as a day visit. Cortona, the beautiful town made famous by the book and film ‘Under the Tuscan Sun’ – about an hour by car. The Sanctuary of St. Francis at La Verna – a fascinating place to visit with the site being spectacularly located. The usual change-over day is Saturday and the usual rental period is in units of one week. In low season we may be willing to deviate from this.